The Indianapolis Colts defeated the Tennessee Titans, 38-10, in Week 11 of the 2018 NFL season. The Colts’ defense dominated this game thanks to a strong push from their front seven. Jabaal Sheard, in particular, made some huge plays, finishing with two sacks but also multiple other quarterback pressures. Margus Hunt was another player who really stood out before going down to injury in the first half. He was constantly beating Titans’ offensive linemen in the run game and making some big plays. He had a couple of solo stops and even more plays in which he affected the intended path of the Titans running backs. The Colts’ offense was firing on all cylinders against Tennessee. Quarterback Andrew Luck completed nearly 80 percent of his passes, a season-high, and threw for just shy of 300 yards. He repeatedly went to T.Y. Hilton, who set his own season-highs with nine catches for 155 yards. Indy’s offensive line once again kept Luck clean. They didn’t allow a sack for the fifth-straight game and rarely allowed any sort of pressure to affect Luck. Even before he went out with an injury, this was not a good game for Marcus Mariota. He mostly checked down and didn’t look to stretch deep at all. When he threw intermediate passes, he missed on most, including one really bad interception that he threw right to a defender. His fumble on the strip-sack didn’t help the Titans much either. The offensive line for the Titans really had a hard time blocking, specifically in the run game. Derrick Henry got some garbage-time numbers, but Dion Lewis had just 24 yards on 10 carries. Most of those yards came after first contact, too. Quinton Spain and Jack Conklin, in particular, really struggled to open up any holes. Luck went after Adoree’ Jackson in coverage often, and it looked like Jackson’s worst game of the season. He was tasked with covering Hilton for much of the game, who was able to get open with ease on a handful of occasions. After getting quite a bit of pressure on Tom Brady last week, this was a complete flip of a performance by Tennessee’s pass rushers. They didn’t get a sack and may not have even gotten a hit on Luck in the entire game. It’s certainly possible to disrupt the quarterback without gettings sacks or hits, but they really just struggled to get any sort of pressure. 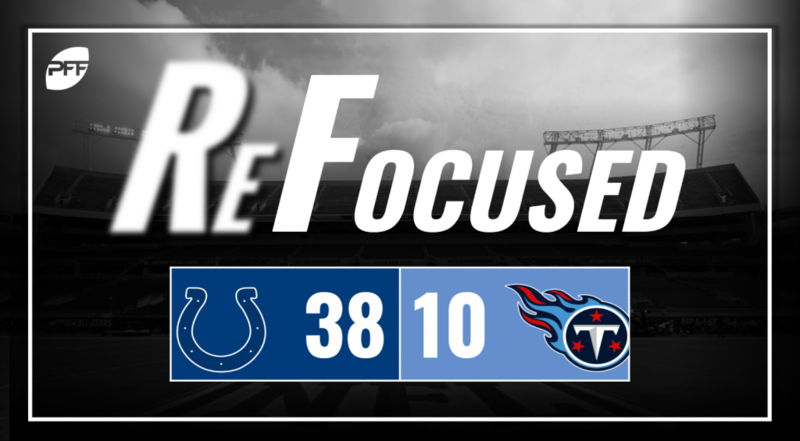 The Colts put together one of their most efficient passing games of the season to steamroll the Titans’ defense to the point where it was going to be difficult for Tennessee to keep pace even if they had a better day on offense. The Titans’ offensive line couldn’t get any push going and that led to an ineffective run game, while Mariota had a couple of bad turnovers that put this game away even before he was injured.